Students in Loudoun who are preparing to join the auto industry are receiving lessons from experts in the field. 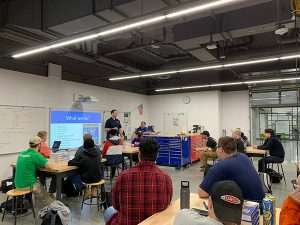 Daryl Collette, founder, and owner of Automotive Quality Solutions met this winter with students in the Auto Collision class at the Academies of Loudoun. The classes are part of Loudoun County’s Monroe Advanced Technical Academy– formerly Monroe Tech. The vocational-technical program is meant to help students discover the kinds of work they’re passionate about and develop skills. The MATA program moved from its old location at Monroe Tech this year. The auto collision and auto servicing programs have two-story labs with up-to-date equipment, as well as classroom space. Collette talked with the students about different opportunities in the industry and the types of work done at AQS. “There are so many specialized techniques we use, including auto detailing, paint protection, paintless dent repair, headlight and wheel restoration. However, the most important thing I tell students is this: be present, take pride in your work, and take care of the customer. That’s what really takes you far,” Collette says. He showed them real-world examples of jobs done well and poorly. He also talked about the perks of the job with attending auto shows and working on unique vehicles. Dave Williams is the teacher of the class and is a MATA (formerly Monroe) alum. 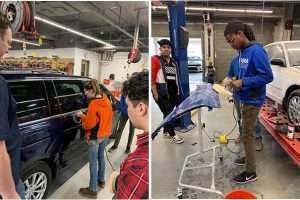 “Having AQS talk to the students gives them a fresh taste of what’s happening in the workforce, and it gets them inspired to work hard and have a vision for the path they may want to take in the auto industry,” Williams says. Collette also uses the visits as an opportunity to recruit potential interns. “We’re looking for people who have the enthusiasm for auto work, and the base of technical training that the students are receiving at MATA. They’re coming out of the program with up-to-date skills and practical experience from being in such a hands-on environment,” Collette says. AQS is open Monday through Friday from 8:00 am to 5:00 pm and Saturday (for estimates, drop-offs, and pickups) from 9:00 am to 1:00 pm.